Start the day with a warm glow inside by tucking into this sustaining and nutritious breakfast. This tasty porridge is served with warm dried fruit compote, which adds sweetness and a good range of nutrients. Oats are a whole grain and a rich source of soluble fibre. They also contain protein, iron and calcium. This dish provides a good source of energy and is ideal for cold and dreary mornings. A filling breakfast such as this will help you resist the temptation to snack on unhealthy foods during the day. 1) In a pan, warm up the apple juice with the nutmeg, cinnamon, cloves and honey. 2) Add the dried fruit and lemon zest and simmer gently for about 20 minutes, or until the fruit is soft. 3) Mix together the rolled oats, semi-skimmed milk and water in a separate, heavy-based pan and gently bring to the boil, stirring steadily. 4) Simmer the oat mixture for about 5 minutes until the desired consistency is reached. 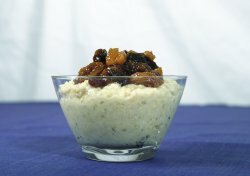 5) Serve the porridge and top with the cooked dried fruit. To save time, the cooked dried fruit mixture can be prepared in advance, stored in the fridge and used hot or cold the following day. Oats are ideal for breakfast time as they are quick to cook. For variety, try using different dried fruits from time to time, such as dried berries.